There’s a new gourmet pizza delivery chain with national ambitions in the Lake City. Here’s how it stacks up. We’re pizza-rich and cash-poor so when a new pizza place opens, especially one claiming to be gourmet (translation: higher-priced), piquing our interest takes more than coupons or claims-to-fame. 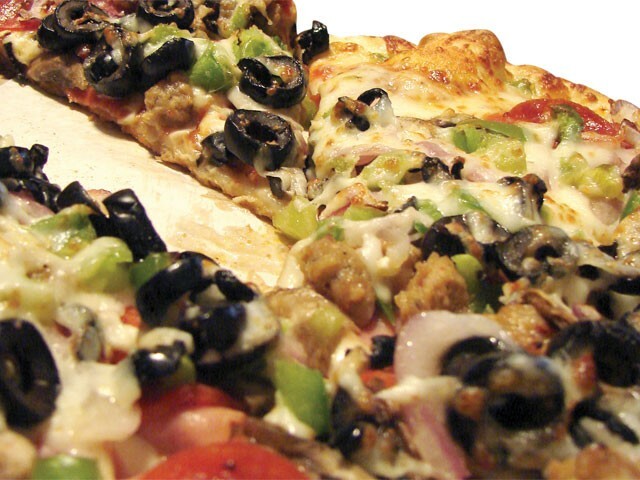 In the Coeur d’Alene area, whitepages.com lists more than three-dozen “pizza” providers. Just a few, like Garlic Jim’s, which opened last summer, claim to be gourmet. What is gourmet? According to Garlic Jim’s, it’s not exotic toppings, but fresh dough, sauce not from paste, and whole-milk, never frozen, mozzarella cheese. So it should taste better… but better than what is the question. On our first go-round, we ordered pizza for pickup. The online menu lists a dozen special pies from (tell me this isn’t slick marketing) Medium ($15.49 and up), Large ($19) and Extra Large ($21). There’s the unlikely Nutty Chipotle (sausage, pepperoni, red onions, tomatoes, cashews), standard veggie and colossal Herculean (salami, pepperoni, Canadian bacon, beef, sausage, bacon). You can also design your own. They sell sandwiches like basil pesto chicken ($6), chicken wings (10 for $7), salads and — surprisingly — single pints of Haagen-Dazs ice cream ($5). On our second go-round, we opted for delivery, which Garlic Jim says makes them different. “Gourmet, Right Away” is their slogan, according to the Website, which describes how Seattle’s Jet City Pizza founder built the business to a nearly nationwide chain. “Nationally, nobody was getting to the door as fast as Domino’s and Papa John’s with a pizza that, frankly, we say is worth eating,” he is quoted as saying. Domino’s, eh? The pizza chain that is currently trying to reinvent itself with a customer-“inspired” pizza celebrating 50 years in the biz? So we calculated an equivalent distance, pizza and price, ordering online a large chicken bacon ranch from both Garlic Jim’s ($22.24 with tax, delivery) and Domino’s ($19.02). Our neighbors think we’re nuts. The results tended slightly in Garlic Jim’s favor, but there wasn’t enough difference to wow us one way or the other or to convert us from our preferred pizza purveyors (which shall remain nameless). Garlic Jim’s, 405 W. Neider Ave., Coeur d’Alene, is open daily 11 am-11 pm. Visit www.garlicjims.com or call 208-930-4818.